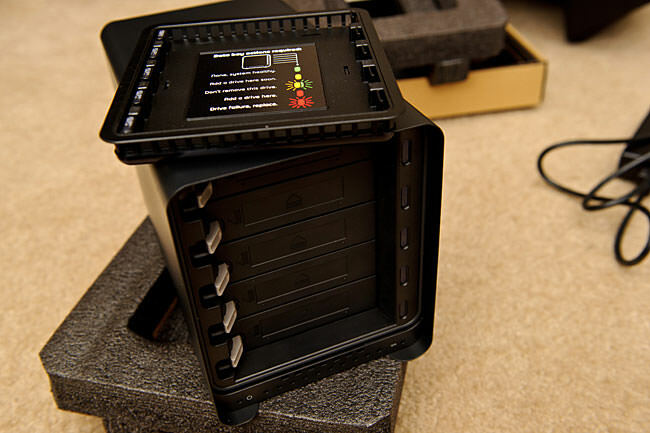 This is a review of the new Drobo S second generation 5-bay storage array by Data Robotics. Although the Drobo S is officially known as the 2nd generation unit, my PC recognized it as a 3rd generation Drobo S, so I’m not sure what I should call it. I guess I will simply call it the “new Drobo S” for this review. There are several reasons why I decided to write this review. First of all, Drobo products are gaining more and more popularity among photographers and in many cases are becoming a part of their workflow. While some well-known photographers have already endorsed Drobo as a photo storage solution, I wanted to see exactly how fast and reliable this unit is for storing photographs, compared to internal and much cheaper single/dual disk external storage. Second, I have been working with some of the best DAS/NAS/SAN storage solutions during the last 5 years (from small business to enterprise-level storage solutions like EMC Clariion) and having a pretty good idea on what to expect from a storage array, I wanted to see what Drobo has to offer compared to other similar products like Netgear ReadyNAS Pro. Lastly, I wanted to test and see how well the new Drobo S works with the latest technologies like USB 3.0 and how the new eSATA port performs in comparison. I will do my best to make this review as objective as possible, with plenty of data and screenshots to back up my words. 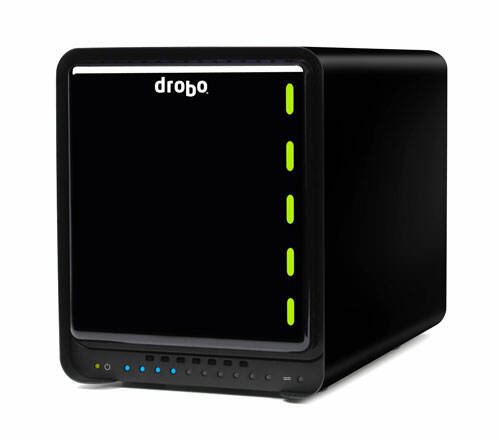 Drobo S is a 5-bay Directly Attached Storage (DAS) device developed by Data Robotics, targeted at “creative pros, photographers, videographers, small office/home office”, as stated on their website. While designed with simplicity and reliability in mind, the Drobo S uses a fairly complex, proprietary “BeyondRAID” technology with a single or dual drive redundancy, which means that your data would be safe even if two drives were to fail at the same time, as long as dual drive redundancy was enabled before drives failed. On top of that, “BeyondRAID” has some great features like mixed drive size utilization, which allows mixing any size SATA hard drives, and instant expansion, which allows users to insert additional drives when more storage is needed. Traditional RAID technologies such as RAID 5 and RAID 6 have certain limitations and do not provide as much storage as BeyondRAID, especially when mixing small and large hard drives of various sizes. Lastly, the self-managing and self-healing features of the Drobo family are very attractive – if a drive experiences a failure such as a bad block, the system switches to a “self-healing” mode, where it will try to work around bad sectors and return to normal state. During such failures, the system will blink with red lights in front of the unit and will prompt you with warnings (through Drobo Dashboard), indicating which drive must be replaced. Drobo S also proactively monitors the amount of free space available on the unit. If you get to near full capacity, Drobo S will notify you through lights and its dashboard software. In short, the Drobo S is a single large storage unit that is designed to consolidate your data into one place, or serve as a backup device to store data from multiple machines on your home or office network. While some of the features like single/dual drive failure and instant capacity expansion without downtime are available on many storage arrays nowadays, Drobo S comes with some unique features that cannot be found on any other products on the market. For example, if a single drive fails on a RAID 5 array, the rebuild time would take a significant amount of time, whether your drives were full or empty. Drobo S works very differently in this regard – the rebuild time depends on the total amount of data stored on the unit, so if you are not storing much data on the Drobo, you would not have to wait long to be able to fully utilize the system. Another cool feature is the ability to use drives in any order. If the Drobo S fails, all you need to do is take out the drives and put them into a new Drobo S in any order and you are back up and running. Other systems would require you to label each drive and put them in exactly the same order – if you messed up, you could potentially lose all of your data. Consolidation: My photo library is growing too fast and is barely fitting on my 2 TB internal/external drives. I also had a bunch of files (iTunes music, movies, etc) on other hard drives that I could not keep in one place. So I wanted to consolidate all of my data into a single storage array and Drobo S seemed like a great solution to my problem. Workflow and Lightroom: I wanted to move all RAW files, including old Lightroom catalogs to Drobo. It is never a good idea to keep both Lightroom catalog and photos on the same drive for performance reasons, so I wanted to keep the most current catalog on my local SSD hard drive, while keeping the RAW files on the Drobo. Data Protection: Drobo is a safer way to keep photos than a single hard drive or a RAID 0 array and it can live through up to two drive failures. Access files from other computers: Since the Drobo S is a Direct-Attached Storage, I thought about mapping it through Windows sharing to other computers on our home network. It is often painful to work on photos, since both Lola and I need access, but only one of us can work at a time. Lightroom catalogs cannot run from network drives, but the photos can be stored anywhere. As seen above, the Drobo products have some great features compared to other storage arrays. Now that’s a clever and beautiful design! All you do is insert hard drives and voila – they are connected without using any screws and screwdrivers. You can see why Drobo prides itself on simplicity. Next, I added a few drives and hooked the unit up to my PC. Huh? What is that supposed to mean? My Internet connection was working, the new firmware file was downloaded (I checked the Drobo folder), but it could not install the firmware! I started Googling for answers and after 15-20 minutes or so of reading various forums, I ended up nowhere. Next, I picked up my phone and decided to call Drobo tech support. My wait time was not bad, about 3-4 minutes before a tech support person answered the call. I told him about what was going on and that I could not connect through eSATA and that USB 3.0 works at 2.0 speeds, but the unit won’t recognize my hard drives. The guy put me on hold for about 5 minutes, then came back with an answer. Apparently, my Drobo Dashboard was outdated, which is why the firmware would not install. I told him that I was running the latest Drobo Dashboard 1.7.3 that I downloaded from their support site and he told me that the new version is apparently not even posted on their website yet. He then gave me a link to download the 1.8.2 version of Drobo Dashboard. 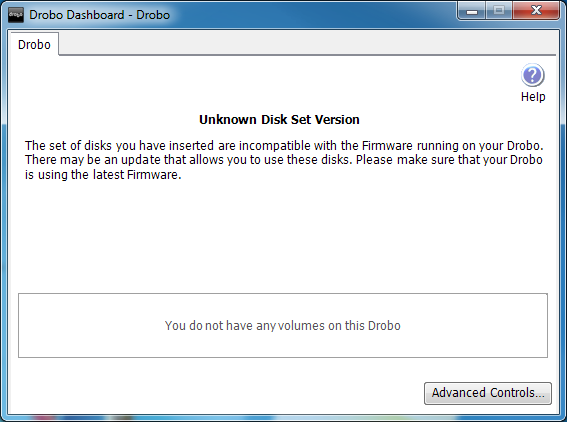 Apparently, the v2.1.0 firmware could only be loaded with the 1.8.2 version of the Drobo Dashboard. Everything seemed to be working now. Next, I tried to copy a few large files through Windows to the Drobo. The transfer speed was not very bad for a USB 2.0 specification – I was getting around 20-25 megabytes (MB) per second. But 20-25 MB/sec is very slow (my super slow WD MyStudio II external drives give me around 30 MB/sec) and with the really fast enterprise-class hard drives I was using, I knew I could get a lot more. So I tried to see if I could get USB 3.0 to work. I struggled for a few hours and tried everything I could, including updating the BIOS on my motherboard and USB 3.0 firmware/drivers. USB was still working at USB 2.0 speeds. Before finally giving up, I called Drobo tech support once again. I was asked if I was calling about an open or a new case. I said that I called earlier and the tech looked up the ticket. He then told me that the guy who originally helped me was supposed to call me and that he could not assist. I told him that it was a different issue and he insisted on them calling me back. He got my number and told me that I would get a call shortly. Great! I waited and waited and I knew I would not get a call anytime soon. I picked up the phone and called again. This time, I did not say that I was calling on an existing case. For my next call, I wasted over an hour on the phone with no results. I tried doing everything from rebooting the unit and my PC, to trying another USB 3.0 cable – all to no avail. The guy then tells me that my USB 3.0 controller is incompatible with the Drobo S! I finally gave up on trying to make USB 3.0 work. With the useless help from tech support, I thanked the guy and hung up the phone. Next, I jumped on eSATA to see if I could make it work myself. I connected the Drobo S through eSATA to see if the original problems were still there, now that I had the latest version of BIOS and drivers. Drobo Dashboard immediately recognized the unit and everything was now working great! Oh well, I guess it was my bad for not having the latest BIOS and drivers to begin with. My next project was to measure the performance of the Drobo S.
The results of the benchmark, as you can see, are very disappointing. The sequential read is a pathetic 26.9 MB/sec, sequential write is even worse at 18.8 MB/sec and random seek + read/write is at 2.48 MB/sec! I first could not believe what I saw. I then ran two more tests and got about the same results, at 26.8 MB/sec, 19.1 MB/sec, 2.54 MB/sec (second test) and 26.7 MB/sec, 18.8 MB/sec and 2.50 MB/sec (third test). As you can see, the performance results are consistent. And that’s with fast 7200 RPM WD drives with 64 MB cache! Yikes! The WD Studio II is configured for RAID 1 (mirroring) with 2 TB drives that are slower than the WD 2 TB drives I was using on the Drobo! Both read and write performance were higher at 29.2 MB/sec and 27.0 MB/sec, respectively, and the only test where the Drobo S was a little better was the random seek test, where the WD Studio II only gave me 2.27 MB/sec (compared to ~2.50 MB/sec on the Drobo). And that’s with the WD Studio II connected via USB 2.0! Obviously, it is unfair to compare a hard drive to an SSD drive, so treat the above as a reference point only. NOTE: No additional read/write operations were taking place on the Drobo S while the above tests were performed. I will be posting a detailed Netgear ReadyNAS Pro review with more performance benchmarks, but as you can see, the ReadyNAS Pro blows the Drobo S out of the water, with 2x read, 4x write and over 10x faster random seek speeds! I had a really crappy gigabit switch while performing the tests and I know that the ReadyNAS Pro can give up to 100 MB/sec read and write speeds. In addition, the above stats are from a very standard, non-tweaked ReadyNAS Pro configuration. If you are looking for a storage unit with good performance, look elsewhere – the Drobo S will slow your drives down. What about Lightroom performance? Unless you are fine with waiting forever, forget about moving your RAW files to the Drobo S. Lola could not stand how slow the Drobo S was when she was trying to edit photos. It took forever for Lightroom to generate thumbnails from RAW images and working with photos was just unbearable. I’m sure JPEG performance is not as bad, but opening RAW/DNG files was very painful. And that’s with my catalog sitting on my local SSD hard drive. I have been playing with the Drobo S for about two weeks now and here is a summary of what I like and don’t like about it. Exterior design and easy drive insertion/removal: I really like how Drobo designed the Drobo S product. Screw-less insertion and removal of hot-swappable hard drives is very nice and the exterior design is certainly very pleasant to look at. Front lights: The indication of how many drives you have, along with their health status is a great feature. I like how the lights change colors when the drives fill up or when a drive fails. Rebuild time: With only a few gigs of data loaded on the Drobo S, I added another drive and the rebuild time was surprisingly fast. It certainly helps to have a small amount of data when expanding. Easy to use interface/software: The Drobo Dashboard is very easy and intuitive to use. You can manage all tasks such as creating a new volume, formatting, etc. all from the dashboard and it works great (when it works). Good as a backup solution: Drobo S would be a great backup solution, because it makes a lot of storage from your hard drives available. Drobo S is extremely slow, even when using eSATA. As shown above, the maximum throughput I have been able to get is around 25-30 MB/sec, which is super slow when compared to external drives or other storage solutions like ReadyNAS Pro. BeyondRAID is a proprietary technology. If you experience a failure, where Drobo fails during the rebuilding process or for whatever reason cannot recover your data, you cannot easily hire a data recovery company to get your data back from those drives. While the rebuild time is certainly fast when you have a limited amount of data, you will have to be extremely patient if you are over 60% capacity. I ran a test with around 80% full Drobo S and replaced one of the drives. The process has been running for the last 4 days. The data has been virtually inaccessible during this time, with extremely slow performance. 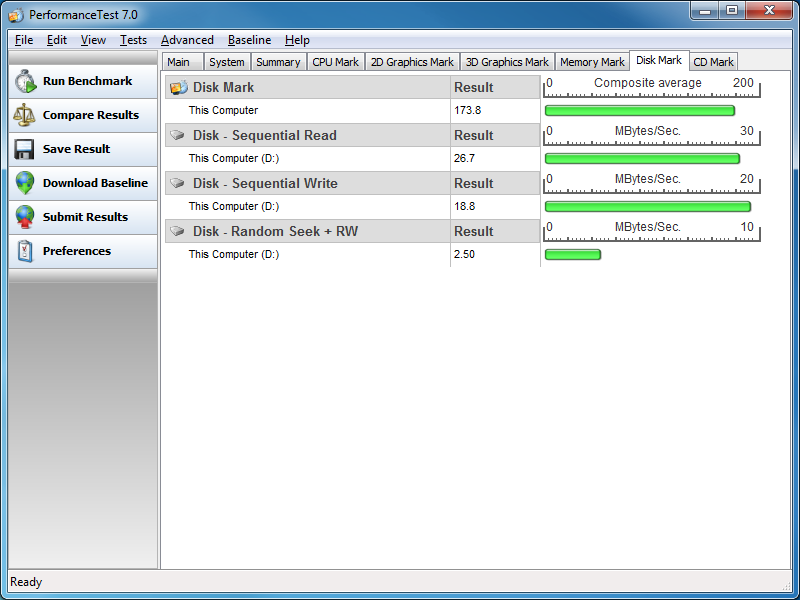 I did a similar test on the ReadyNAS Pro and it fully rebuilt the array in about 22 hours. The new USB 3.0 port is virtually useless. I have done everything from updating my motherboard BIOS to the latest version to installing the latest drivers and I still could not get it to work. Drobo support tells me that my chipset is not compatible. My motherboard is Gigabyte GA-X58A-UD3R, which is one of the most popular motherboards on the market today. I am surprised that it is not supported. Firewire 800 was not any faster than eSATA. My WD Enterprise-class 2 TB 7200 RPM drives were running so hot, that I could barely touch them. The ventilation for drives on the Drobo S is horrible. Running hot drives continuously will make them fail quickly. The Drobo S started producing low-pitched fan noise after several hours of use. The firmware upgrade process was painful (see above). Technical support was horrible, with techs not having a clue about eSATA or USB 3.0 technologies. If you are looking for a large storage array to backup your photos, movies and other data, the Drobo S offers plenty of great features and squeezes the most amount of storage from your hard drives. However, if you are looking for a fast storage array, or a solution to consolidate your photographs/data into one location to simplify your workflow, the Drobo S is not something I would recommend. As you can see from this review, Drobo’s biggest problem is its performance, even when fast SATA drives are used. Drobo’s claims like “blazing fast transfer speeds for creative professionals and small businesses” are simply marketing gimmicks and the new USB 3.0 interface is useless, if your hardware does not fully support it. Even getting eSATA to work was quite painful – not something a beginner would be able to do on his/her own. Drobo’s technical support was simply horrible and I had to figure out most of the stuff myself. Drobo introduces new technology and yet its staff does not know how to make it work. And by the way, I never got the promised call back from Drobo’s 1st tech support guy! So, what is Drobo S good for and how would I use it? First, I would not use fast SATA drives that get hot in these units. As I have pointed out above, the ventilation is simply not good enough to keep the fast performing drives cool. I would just get some cheap 5400 RPM drives and only use Drobo as a backup device. Why waste your money if Drobo slows down those fast drives anyway? Think of it as a large, external backup hard drive. If you have some computers and data that needs to be backed up, the Drobo S is a good candidate that you could leave running at night to do the job – that’s what it is good for. It is fully compatible with Apple’s Time Machine and works very well in that configuration. Another case where you could use Drobo is if you have a lot of data that needs to be dumped somewhere for archival purposes. Like your old photo catalogs of your customers that you no longer need to work on. As for me, I will be returning the Drobo S – at $750+ USD (without hard drives), it is a very expensive backup solution that only complicates and slows down my workflow. Ugh. That’s a really ugly review. Thanks for posting your results. I was thinking of getting one to test for myself, but I think you just saved me the trouble. I now have all my music and photos (mostly RAW) split across two partitions in an external 2TB drive. Think I’ll hang on to that arrangement for a while. If there’s one thing I’m paranoid about it’s backups. I back up my data compulsively. I recently had an electrical spike that toasted my UPS/power conditioner and destroyed my external drive. I didn’t lose any data other than some files I’d created within the last 20 minutes. Great article. There is a large community looking for a solution to; NAS storage of photo image files with access from multiple workstations running managment software like Lightroom. What is the best solution available ? What solution gets close? I had same problem about speed with my Drobo (usb2-fw800) now i switch to nas (QNAP) and i’m very happy with it. Fabien, I have heard great things about QNAP NAS units – they seem to be very comparable to Netgear ReadyNAS Pro products. Maybe there is something else wrong with this unit? Daniel, performance benchmarks depend hugely on the size of the data chunk – that’s why numbers from one benchmark are not going to be the same as when compared to another. In addition, there are other types of variables involved here – PC speed, OS type, eSATA/USB card type and chipset and much more. The above tests are done on a Windows 7 64-bit OS and the motherboard eSATA/USB/Firewire ports were used for the tests. I might have gotten better results if I had used a dedicated eSATA card. Either way, it is certainly not acceptable for me that the Drobo S performed as slow as my external drive – the 70mb/sec+ performance seems to be unrealistic to me, given how slow it was when compared to other devices. I might request another Drobo S or Drobo FS for testing to reconfirm my findings. I have a Drobo-S, the initial version. Probably the only difference is the absence of USB 3.0. Before I purchased it I researched on the net. I was looking for backup functionality in any case and I noted reports that it was likely to be too slow as an internal hard drive substitute and that faster disks get hot and may not be suitable. So I use it for backup with WD Caviar Green disks of various specifications. I connect with eSATA and speed is not a problem, maybe it wouldn’t be with USB 2.0 anyway because Acronis offers various continuous or intermittent options and backup occurs in the background without appearing to slow anything down. I don’t have a problem with disk noise. 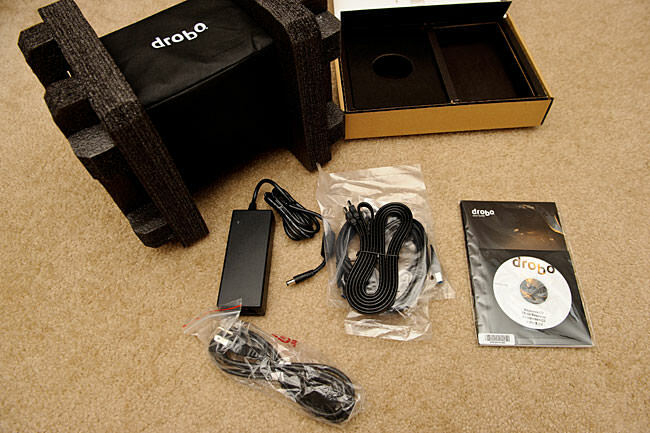 I also have had good responses with Drobo technical support. One thing I think would be useful would be if they allowed general read-only access to the Forum so that potential buyers could troll through the posts. As it stands, you have to buy one to get access. I have encountered one problem which is that the Drobo appear incompatible with a Windows image backup. This apparantly changes the format in some way and causes bootup to slow down in my case by 17 minutes. Acronis Image backups, though are OK; you just need to save Windows backups somewhere else. I’ll reformat it in a while but I’ve got some RAID problems on the PC to sort out first. The Drobo-S is fine for my purposes, functional simple and adaptable, as indeed your review would suggest. Murray, thank you for your feedback and I apologize for missing your comment! Seems like Drobo is working out for you and you are overall happy with what you have. As for the 17 minute bootup time, that sounds pretty bad…I don’t think I would be able to live with that kind of pain for longer than a day or two. I hope you were able to find a solution! Very good review Nasim. I was considering getting one myself once they jumped on the eSATA bandwagon, but after reading many reviews similar to yours I decided to save myself the grief. I like the concept, but the speed of their proprietary RAID appears to not be worth the other advantages for my needs. USB 3.0 is also not ready for prime time, with almost any product out there. I’ve tried a number of USB 3.0 single drive enclosures on various controllers and eSATA wins out every time for large file transfers. Aaron, thank you for your feedback and I apologize for a late response. I agree about USB 3 – I have also tried a few new devices with USB 3 and it is certainly not ready yet. As for the RTX400, I have heard about it and read some online reviews, seems like it is better than Drobo when it comes to performance. Actually, there are quite a few products out there that work very well. I am still using the ReadyNAS Pro unit and I love it. 10TB of space and very fast speeds! Nice! I got to play with a ReadyNAS a couple weeks ago, and it was pretty good. It was limited to gigabit speeds since it was on the network, but the web interface wasn’t bad. Great review, i read your review after they had shipped the new drobo s (10 TB) to me and i called to discuss this with the company. i have not done the speed test yet but your information was very helpful. i was able to avoid a lot of stress because of your insight. Here are a couple of very helpful things i was told. This is a very hard problem to identify please read carefully, even if you are not using a DROBO. The 64bit version of Adobe products has a problem with it that can cause your drive or your printer to stop working. I believe it has to do with the way it labels or describe certain files attributes in adobe. i ran into this issue while using the 64 bit version, the drobo would suddenly disappear and the printer had an error unknown file type. Adobe took about 2 hours to fix it but they had seen it before, they had me switch back to the 32 bit version of the software and everything worked fine. I had to change my settings on the drives, they default spin down setting causes the drives to sleep after 15 minutes and they must start back up the first time you go to use them. Very often i will work on a photo group longer than 15 minutes so this seemed like it would slow me down so i changed it to 2 hours. Don’t know if this setting effected your tests or not. i was told by drobo that windows would work fine with esata but apple was having some issues with it. I found the same thing you did; esata would not work with the drobo on my Dell laptop so i am using USB3. When i called back a few days later tech support was pushing me to use USB3 not eSATA. Don, thank you for your opinion and mini-review – looks like you experienced very similar issues as well. I did not know about the 64-bit and 32-bit Adobe Lightroom issue. Were you trying to keep your Lightroom library on the Drobo S unit itself? This would certainly be a bad idea, as Drobo S should not be used to read from and write to the Drobo (even Drobo suggests not to do that). Ideally, you want to keep your Lightroom catalog file on the local hard drive and keep your photographs on the Drobo. This would work reasonably well with JPEG files, but if you shoot RAW like I do, forget about it – Drobo would be too slow to work on RAW files within Lightroom. As for hard drives and why Drobo does not mention the black drives – as I have indicated in this review, my WD enterprise drives got extremely hot after a while, so I think the problem here is primarily ventilation issues. The Drobo is just not designed to keep so many 7200 RPM drives cool, which is why the green drives work so much better. I thought I would move to something like Drobo for its simplicity. However, your review has changed my opinion. For an amateur hobbyist, what are your thoughts about online storage and backup like amazon s3, mozy, etc? SM, online storage is good, but it is VERY expensive. If you only archive JPEG images, it might not be as bad, but for RAW storage, online solutions are too expensive and slow (due to traffic throughput). First of all, I want to express my sincere appreciation for all your hard work, insight, and careful advice given via your website. I have found the articles written by you and your wife to be tremendously helpful over the last several months as I ramp up my own passion for photography again after many years of neglect. However, I find this particular article regarding the Drobo S rather troublesome. I happen to own 2 Drobo S units (one first generation, usb 2.0/FW800/eSATA and one second generation, usb 3.0/FW800/eSATA). My throughput numbers are remarkably different from your own, and I wanted to share my own numbers with your readership. Both units are populated with (Qty 5) 1TB Western Digital Caviar Green hard drives, and connected to a Mac Pro via eSATA. The drives are formatted using HFS+, and I’ve been using them for a long time now with ZERO problems. I would also like to note that I’ve enabled the “dual disk redundancy” feature in the past, and the impact upon read performance was virtually zero, while writes dropped about 5-7 MB per second lower. If you want the extra peace of mind, you can have it with very little impact on performance, although you will have to give up about 1 disk (the largest in the array) of usable storage space. Personally, I trust the Drobo completely, so I chose to configure mine for greater usable space. In summary, I have found the Drobo S to be FAST, stable, and VERY reliable. Your low throughput with the Drobo S must be a configuration issue with your Windows PC. I have provided my email address as part of this comment, and if anyone would like screen snapshots of my drive benchmarks, I would be happy to supply them. Eusuf, thank you for your feedback and I apologize for responding late to your comment. As for your tests, I wonder how you are actually conducting the tests and what read/write methodology you are using. The 85 MB throughput you are getting is most likely cached data and it is not true throughput figures, as it would be close to impossible to squeeze that kind of performance out of slow SATA green drives. Your write speeds are close to what I got with an SSD drive, which is just unrealistic. Try copying a 20-30GB single file from your local hard drive to the Drobo and let me know what speeds you get at the end of the transfer – that would be more or less realistic. No, the tests were conducted properly using several benchmarks, particularly the AJA Video Systems www.aja.com/) test application. In every instance, a minimum of 1.0 Gigabytes (and often 2.0-4.0 Gigabytes) was written to the Drobo S, and then read back. Therefore, the data set involved far exceeds the cumulative disk cache size, and thus must reflect the true “bits to disk” performance of the Drobo S.
I do a significant amount of video editing, so disk throughput is a key performance metric. The Drobo S has consistently provided read/write throughput of approximately 85 Megabytes per second. I have copied entire directory structures that are over 30 Gigabytes in size, and the Drobo S has maintained 80+ Megabytes per second in each and every case. If all of your disks are producing such poor performance, something must be configured incorrectly. I’d be happy to attach screenshots of my benchmark results if your comment section provided that functionality. Perhaps I can email the screenshots to you directly? Eusuf, 1-2 GB of data might not be sufficient for testing purposes, as some applications will cache the data into RAM before putting it into the drive. Benchmark software also can measure performance differently. Often times, hard drive performance benchmarks are meaningless, if no direct comparison is provided against other products. Just try copying a 10-15 GB file and measure the true performance from start to finish and then divide it by seconds. Try using different types of software to copy the files and you will see more or less “true” performance. Benchmarks can often be misleading, as there are many different variables involved, such as file size, block size and caching. Finally, fill up your Drobo to around 90-95% and see what kind of speeds you are going to get. You will see the true face of the “BeyondRAID” technology. Just FYI, I have been working with various storage products (including EMC Clariion, NetApp, HP) for over 10 years now and my background is in IT. Nasim, this is an amazing review. You should review for the tech sites like Gizomodo or Engadget! I’m not a professional anything, but I will eventually have 5,500 CDs worth of losslessly compressed music, hundreds of DVDs and possible Blu-Rays (if I can figure out an easier way of archiving my BR discs!). I’m assuming that “playing” this media from the Drobo will not tax the speed limitations. I should note that I’ll probably pick the NAS/Gigabit version. But I am starting to edit photos in RAW, as well as video, more and more, and am thinking that I might want to use a faster 2TB or 4TB NAS for current work and use Drobo for backup. You MUST be a busy man, but I’d appreciate your thoughts. Such are the demands that a thorough review create! And on top of that, I am noticing your posts on photography tips, esp. the Nikon related ones- dude, when do you sleep? Or actually take those gorgeous shots? Rob, I guess you were right about me being busy – sorry that I missed your comment and did not have a chance to reply to it for a while. 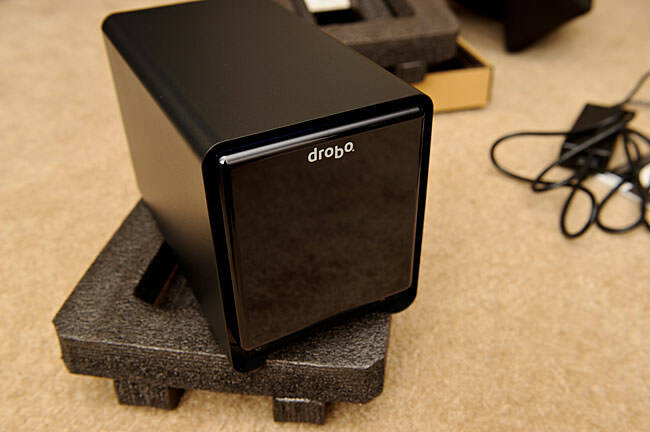 many thanks for posting your Drobo S review. I have used a Drobo 2nd generation box, FW800 and USB 2, for about 18 months. I have never been able to find a good use for it. It is soooo slow. Very quickly I went back to my original workflow. Since I also work with large UNIX computer systems, I know all the rules for RAID and how to do proper back-ups. At home, I use a G5 Mac with 2 CPUs and two monitors for my Photoshop work. I also have a four slot external SATA cabinet (FirmTek) and I use SoftRaid to look after my mirrored RAID drives. I use 2 x 2TB WD Green Caviar drives for a set. Seagate now also sells “green” drives. Drives are “hot swappable”. As you know, 2 TB drives are very inexpensive. In Toronto, I pay $70 for a 2TB Seagate or Western green drive. The slower spindle speed, 5200 or 5900 rpm, is not problem since I only work with still images. I won’t mention the rules for best back-up procedures, but with the 2 x 2TB sets and the four slots I have in the cabinet, I can do back-ups and safety copies at a good copy speed speed. The SATA card give me 88 MB/s. Three sets, i.e. six 2TB SATA drives, cost me $420 — less than the empty Drobo box. For back-ups, full or incremental, I use SuperDuper. A very versatile program that even turns off the Mac when it has finished. Drobo’s problem is that no matter what connectors they put on the box, whatever goes on inside the black box has not guts. Their website describes the Drobo S as FAST! Drobo S would cost me $1130 with tax. What happened to my Drobo? I could not return it and it sat on the shelf for nine months. Now I have turned it into a DVD “Juke Box”. I had old 500 GB and 1 TB drives. I put my favourite DVDs unto a 2 TB SATA drive first. Then I copied these into a 1.8 TB Drobo space, which took 26 hours via FW800. Then moved the Drobo to my TV and plugged it into a WD HD TV player. The picture quality of the stored DVDs is excellent. Should Drobo fail it does not matter. I have the DVDs on a 2TB drive and I have all original DVDs as well. The concept is like iTunes. I have all my CDs stored on the Mac and I have them organized as Playlists on my iPod classic. Thanks again for the very helpful review. It saved me from trying the “S” version. I have been trying to connect Drobo S to the WD HD TV player and have had no luck, can you describe in more detail how you connected the Drobo S to the WD HD TV player. I do not have a Drobo S but I have the 2nd generation Drobo, i.e. the one with Fire Wire 800. The DVDs are simply loaded unto the Drobo with any software extraction program you can find. I organize the titles into folder so that a folder has 20 -30 movies. Then I take the Drobo to the WD HD player and plug it into the WD with a USB cable. Because I have to format the Drobo as HFS+, the Mac file format, the HD box software cannot write to it. It means I have to wait about 4 minutes while the WD builds a catalogue. That catalogue cannot be saved to the Drobo. I can see any movie by looking through a folder on the TV, using the WD remote. Select the movie, select the start and it plays. I use a HDMI Cable to a plasma TV and the WD box converts it to 1080. The DROBO stays connected to the WD Box. When it shuts down so does the Drobo. Every few weeks I take the Drobo to the Mac, trash movies I no longer wish to see and add new ones. Since I own all movies on DVDs it does not matter what is on the Drobo, nor do I care if it ever fails. This blog stands among the very few resources providing serious tests with Drobo S units on the web. – It really depends on the controllers in use in the configuration. Not all chipests vs drobo combinations are working 100%. – In my own scenario, the backword compatibility on legacy ports is completely not functional. – Transfer rates are not high (I did expect something more…especially given the high quality Hard Drives in use)…yet are not outrageously slow. Just average. – Each time the unit is unmounted, it has to be restarted in order to use a different bus. i.e. : switching from USB 3.0 to eSATA2 takes a restart. One thing that puzzles me a lot: I discovered that upon mounting the Drobo, my system loads the full stack of iSCSI kexts….including the iSCSI inititiator. If the so called Beyond Raid technology embeds a Logical Volume Manager + iSCSI module…probably got the reason behind the slow data rates: protocol conversion. If the data are reached through a “external bus —-> iSCSI module ——> LVM ——> Volume pattern” …..then we have no hope of ever seeing fast transfer rates. I thought Drobo would be a good idea when I bought the 2nd generation 4-Bay unit three years ago. I ran it on a Mac G5 over FW800. The first disappointment was the very, very slow transfer rate to load the Drobo. I did not have software to get exact figures but the slow speed was immediately obvious. I ran Drobo with four 1 TB WD green drives. After about a year, Drobo said that one of the drives had failed. I inserted a new drive and could not believe that Drobo took 35 hours to re-organize itself. I erased all data and put DVDs on the Drobo. Since I own all of these, Drobo failure would not matter. Drobo is now used like a juke box streaming data into a WD TV Live Media player which feeds a large plasma TV. The picture is stunning. Every now and then I update what is on theDrobo. The rest of the time it sits next to the WD TV Media player. That little box turns Drobo on as needed and also shuts it down. For my data storage needs, I run external SATA drives off my Mac. RAID is mimicked with software called SoftRAID. I use two 2TB drives as a set in FirmTek enclosures. I have a back-up for each 2 TB set I use. Drobo tells us that a rebuild of RAID takes a lot of time. Nonsense! I can transfer 4TB of data over SATA in about 2-3 hours – a Drobo rebuild takes 30-40 hours. I was almost going to give the “new” Drobo S a try: Their site states: “Your Personal Speed Demon: USB 3.0, eSATA, FireWire 800”. I wonder who in their marketing department came up with that statement. Thank you for your extensive report! You just saved me a lot of money. I have an older (2nd Gen Drobo with Firewire 800) and have always experienced poor performance with it. (HD Tune gave me a max transfer as 48MB/sec, a minimum of 2.1MB/sec, with an average of 24.7MB/sec.) I thought maybe the update was better with eSATA. Obviously not! Think I’ll go with a G-Tech 2TB RAID — much better performance and cheaper, too. Thanks so much for your awesome review (as always!). You saved me time, money and headache it sounds like! What solution would you recommend for around $500? Which ReadyNAS pro model do you recommend? I saw your posting on BH and had to look you up as the website address wasn’t provided but was happy to find your your site, your review and analysis. Very helpful. Sorry to have to say this but Drobo is not a good idea. Whenever you need support they make it look as though I am the problem. The technicians will send you an endless list of what I have to do before a problem is solved. And, finally, the Drobo takes forever to rebuild after a problem. Every reviewer says, “it depends on how much data you have” but no reviewer tells us what that means. It took 47 hours (! ) for my Drobo using Firewire 800 was finished when I had 28% free space and had 2 TB of stored data. Finally, I do not like that my hard drives are totally under Drobo proprietary control. My Drobo box has not been used for two years. YES. I run two LaCie RAID Thunderbolt drives, each has two 2TB drives which can be configured as RAID 0 or 1. Western Digital offers the same type of drive. If you need more space, you can get 6TB or soon 8 TB. What is the HUGE advantage over Drobo? Cost and saving my own time, which is valuable to me! A Thunderbolt drive WITH two 2TB drives costs $590. I can make a back-up anytime to the other drive very, very quickly. You have no idea how fast Thunderbolt can transfer files. That backed-up set is stored off line. Protecting your own data is NOT complicated. And starting off small and having your storage “grow” with Drobo is stupid. It shows a lack of planning. 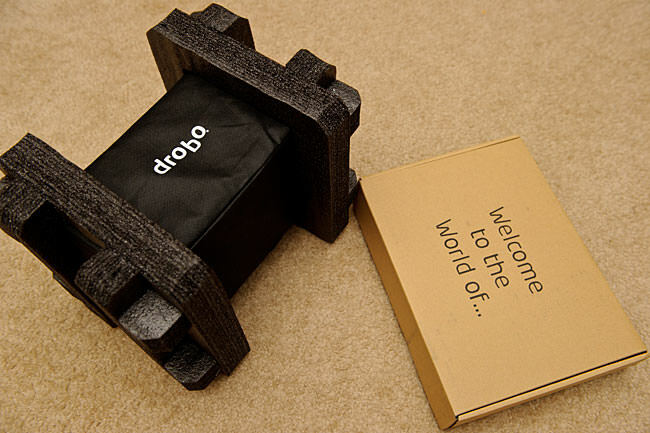 Drobo makes it seem that we have to be coddled. Having data under my control, easy back-up for off-line storage and being able to do this FAST – that is what counts for me. Don’t believe that Drobo talk that regular RAID is not safe. The Drobo approach sounds good the way they spin it. But, as the proverb says, be careful what you wish for! I’ve been happy with my DroboS eSATA until I recently performed an Image backup using Windows 7. This essentially bricked the unit… plus, the computer freezes when connected to the DroboS… can’t use the computer and can’t use the DroboS. After 4 hours it finally unfroze enough so that I could see ONE of the DroboS drives…. So I contacted Drobo tech support and was informed that they have a KB article, #163, dated Feb, 2012, titled: “My Windows 7 computer hangs or is slow to boot when connected to a Drobo storage device. 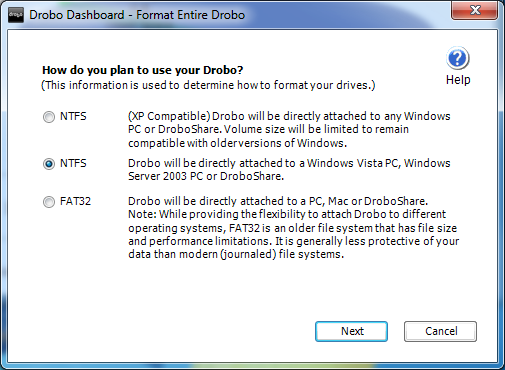 What should I do?”… which explains that you SHOULD NOT USE WINDOWS 7 BACKUP with a Drobo unit. This is a major company policy FAIL. Why didn’t they send their customers a tech support bulletin or notice about this? They told me it’s Microsoft’s problem… well, NO IT’S NOT… it’s now MY PROBLEM and, consequently, Drobo’s problem. My whole business is down until I resolve this issue. It means that I will have to purchase a storage device that can hold the data currently on the Drobo (you can bet it WON’T be another Drobo product)…let’s see, we sell a cardiac monitor that just happens to cause a patient to go into atrial fib if they have a pacemaker, but since it’s the pacemaker’s fault we won’t bother to tell anyone… we’ll just post an all-but-hidden message in our knowledgebase on our website… under the title: “Monitor not working correctly on some patients”. So they post an article that someone will NEVER read unless they already have the problem, screwed the pooch, THEN go looking for an answer…good logic, Drobo… close the barn door AFTER the horses are out…. Here’s how a small business owner reads this situation: Good device but the company that makes it is not protecting their customers… conclusion: do business with someone else. thanks for your review. I must say that I cannot confirm the very slow performance with eSata. I use Drobo S with 2x1TB and 2x2TB and via eSata I have about 70MB/Sec read and 80MB/s write. And that is very good. Im am satisfied! Thanks for the informed review. I have to say I have found their support very good, but the hardware itself actually unfit for purpose and a threat to my data! I’m on my second replacement, with the same problems – an upgraded version even! – 2nd Gen etc. It is still of absolutely no use to me. I have thrown money at 4 or five drives for it, written off two that seemed to work fine in other settings, tried at least 4 or 5 different combinations, rebuilt my storage at least 7 times, and I am still getting the same problems. Drive Genius monitors my drives (as supported by Drobo) and consistently reports dangerous errors within days of a new build / reformat. Drobo support as responsive, but have no solutions. Their recommended solution (DiskWarrior) resolves the issue for a few days before it recurs. Each time I rebuild everything with Disk Warrior it takes several hours of work. This is far from a secure or efficient solution for the storage of my data. They refuse to acknowledge that this product is unfit for purpose, and will not provide me with a refund. I am using a drobo too…. I am terrified of this drive, it has lot of data on it (45 percent full) and it has begun to slow down dramatically. The connector at the back are loose and flaky and when I have to move it I must reseat the drives befor turning it on or I am risking a rebuild because of poor case construction and loose connections on the drive bay. One rebuild took three days! I have bought a synology NAS server, and a simple raid 1 array to back this thing up and as soon as I can get all this stuff organized I am going to pull the drives and sell it for whaatever I can get. I believe this is a poor performing piece of kit and that I cannot rely on it. Would never purchase anything from Drobo again. I have two DROBO units and have been operating them for several years now. With respect to transfer speeds I benchmarked my DROBO S using FW800 from an iMac 27 in (Mid 2011) with an i7 processor and 12 GB RAM. Using the Blackmagic Design Version 2.2 Disk Speed Test and “Stress” setting of 5GB I obtained a High of 64GB/s Read and 47 GB/sec write speed. I am awaiting an eSATA to Thunderbolt adapter and expect about 25% to 30% higher transfer rates when installed. A couple of comments concerning drives and rebiuild times. I initially used WD Green drives .. bad choice .. they are not recommended for the DROBO application. I replaced them with 5 x 3 TB Hitachi Desk Star DATA III 7200 RPM drives for a total of 15 TB of which about 10 TB is usable with single disk redundancy. I encountered a batch of ‘questionable’ WD Green drives and had error messages concerning rebuilding the array on my older DROBO 4 bay unit. The problem resulted in the error message indicating drive access was still available but the array was being rebuilt accompanied by the yellow lights on the drive bays. Rebuild time was quoted in days … and actually it was closer to a week. The problem was subsequently diagnosed and corrected as being an excessive number of bad blocks on the actual Green Drives. One drive had all but completely failed and a second drive was reporting an excessive number of bad blocks. Hence the slow rebuild time. I replaced the “bad drive” with a new WD Scorpion (Black) drive and allowed the system to rebuild over the next 36 hours. I then replaced the second drive and rebuilt the array again etc. untill all four drives were replaced. The above process was slow, I admit. BUT I did not lose a single bit of data even though I had a drive failure and a second drive tetering on the brink of failure. DROBO Technical support was helpful but it did take a little time to get them to respond. However there are a lot of things about their technology that are not intuitive and having a knowledgeable tech assist is a definite plus. I am awaiting the release of their new 4 bay unit with a faster processor and Ethernet connectivity. I will use it to replace my existing 5 – 6 year old 4 bay unit which is presently attached via USB 2.0 to my Airport Extreme router. That is not an ideal setup and is remarkably slow. In summation, DROBO products are in my experience an acceptable backup system and provide secure storage and fault tolerance. Speed is acceptable on the DROBO S and not so good on the earlier 4 Bay unit. In fairness to DROBO I’ll say the USB connection speed from my router is less than ideal and not try to assign responsibility … could be an Apple thing. If you are seeking all-out speed the DROBO is probably not the first choice. For Macs there are any number of very fast Thunderbolt solutions that outpace it. If however, your desire is for a safe and secure back-up system for a Mac (I won’t discuss Windows as I left that behind years ago) then DROBO offers a lot of advantages and reasonable performance. Just my 2 cents …. your mileage may vary. I am using Drobo S on Windows 7; have 4 volumes of 2 TB each. Due to major power fluctuations, files/folders on one of the volumes are corrupted. Other three volume seem to be okay. I just want to delete these corrupted folders, or reformat that volume. Drobo S does not provide volume management utility to selectively reformat just one volume. Can I reformat this one volume using windows disk management utility? Will the other three volumes remain intact? Would greatly appreciate any insights. I have a Drobo S from 5 years ago. 2010. Today my electrical connection Drobo is bad. Always is Orange and black. No possible to Run. I wait answer support Drobo. a) Send the box Drobo to Repair. b) Buy new Drobo 5 D or 5 N and wait my hard disk is compatible. c) Use or Buy old Drobo S to save my files on the computer. Any body sell or provide a DROBO S.
This comment is intended to give readers additional considerations when purchasing a backup solution. I acquired a 5-bay Drobo S as a replacement for a 4-bay Drobo 2nd Gen that was defective. I have to say the Drobo S with its USB 3.0 has been much faster. The Drobo S has been reliable and performed as advertised. It is a well constructed piece of hardware. In fact it is still completely functional. I always liked the way it will take HDs of various sizes, and does not require upgrading all HDs at once to increase capacity. The ability to expand it to a very large capacity is nice but could become a problem. I do have a couple of concerns. Although it works with Mac OS Sierra the company completely dropped support for the Drobo S a few years ago. Yosemite was the last Mac OS that the Drobo Dashboard utility worked reliability on. The second concern is if the Drobo S fails all data will be lost unless I can find another working Drobo S to move the HDs to. This means that if I use it for critical data I will need to back it up. If I expand the Drobo S capacity to a large value (greater than 8TB), backing it up becomes an both a time and size issue. This makes me unable trust it with my photos. Because of these concerns I no longer use the Drobo S for any important data. I’ve actually gone back to multiple RAID 1 enclosures with small capacity HDs (2TB and 4TB). If an enclosure fails, I can put either HD in a dock and recover. Furthermore, I do not have to worry about too much data in one place or dealing with proprietary data format.